My random thoughts, rants, tantrums, silliness, words of support, and encouragement. I am no longer ashamed to be me. My oldest child fell asleep before 11:00 p.m. on Saturday night. He is 15 years-old and it is rare for him to go to bed that early, even on a school night. My youngest is 11 years-old and he fell asleep before 9 p.m. My son is fighting osteosarcoma (bone cancer) and was discharged from the hospital Friday afternoon after a week long stay there. But he wanted in on the action like his big brother. Yes I am referring to the Pontiac Silverdome Implosion that took place on Sunday, December 3rd in Pontiac, Michigan. I woke up at 5:30 a.m., got my sons and myself ready, and made the 45 minute road trip to Pontiac to join others in that historic moment. 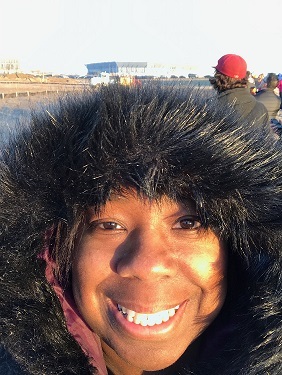 Selfie taken in Pontiac, Michigan on December 3, 2017. The Pontiac Silverdome is in the background. There was a designated parking and viewing area for the public so we left home extra early to ensure that we got a parking spot. Excellent crowd control and there was even free coffee and donuts. Leaving the boys in my vehicle at first (the youngest stayed inside my SUV the entire time to stay warm and recuperate), I got out to walk around and check out the environment. It was as if we were at a funeral. Some people (individuals and families) walked around and socialized with one another. Others stood and stared at the Silverdome in silence. There were times when there was complete silence because everyone was staring at the Pontiac Silverdome for the last time. No one seemed to mind the 34 degree temperature with a wind chill of 28. That is because we are Michiganders. We are used to cold weather. I found a great spot for viewing and tears immediately flowed from my eyes. My surrounding was peaceful. All I could hear were footsteps of others walking up to pay their last respects to the former home of the Detroit Lions, Detroit Pistons, and a venue for countless other events. It was nice to hear stories of who attended the Lions and Pistons games. Others talked about concerts they attended. Of course I had to share my story of when my sister and I attended the Jackson Victory Tour in 1984. She was 14 and I was 12. I did away with the jheri curl decades ago, but that sequin glove I wore to the concert is still packed away somewhere at my mother’s home. 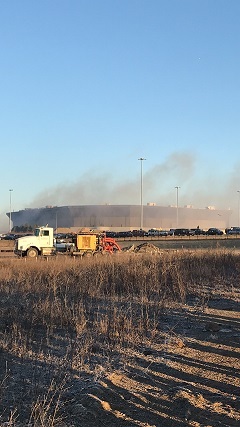 As expected there was a huge turnout for the implosion of the Pontiac Silverdome. Not everyone was able to fit into the designated parking lot. Traffic became backed up on the expressway. As a matter of fact, traffic literally stopped. People got out of their vehicles and watched from the expressway. Like I said, it was as if we were at a funeral. It was a very emotional moment. I did not record the first few seconds of the implosion because the blast from the explosives startled me. Pontiac Silverdome one minute before implosion. Pontiac Silverdome seconds after explosives were detonated. The explosives failed to implode the Silverdome on Sunday. Everyone stood and waited in silence for it to collapse (my tears were flowing heavily) but it wasn’t ready to be taken out just yet! Although the Silverdome didn’t collapse, my sons and I still had a great time and I am sure everyone else had fun as well. A man tossed a Nerf football back and forth to his young sons. I saw a few drones flying around. News helicopters circled overhead and came to a standstill minutes before implosion. However there is always that ONE person that has to be a standout. The guy I parked next to started talking to me before I even turned my engine off. He said he was trying to get famous and wanted his 15 minutes of fame. 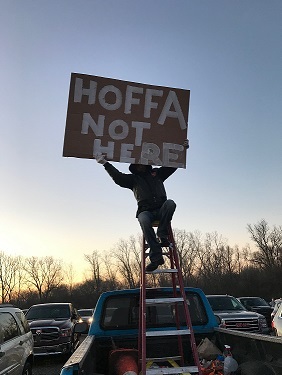 He said he was going to let the top of his truck down, climb up his ladder, and hold up a sign he made. He told me a chilling story about something he and his friend saw when he was 15 years-old. The story is too long to type in this blog post, but he said they saw a hand sticking out of a box. They believe Jimmy Hoffa was in it. I don’t know if that story was true or not, but he said that is the same story he’s been telling for years and it never changes. A lot of people stopped and took pictures of that man and his sign. Some of them even took selfies (I also took one) in front of him. At times he even had a small gathering at his truck. They were old schoolers like myself and I joined in on a couple of the discussions. He held that sign up in the air the entire time. Maybe his Jimmy Hoffa story is true, maybe it’s not. But it was a heck of a story and generated a lot of talk. 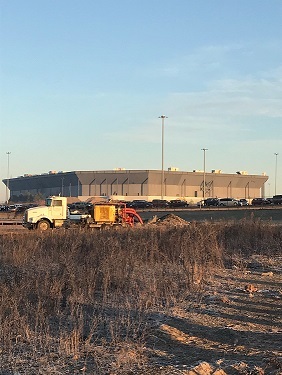 The Pontiac Silverdome in Pontiac, Michigan was successfully imploded the next day. I was okay with it because I had bid my farewell the day before, on its’ original implosion date.